A beautiful image published by NASA, taken by the unmanned Cassini-Huygens spacecraft, shows the Earth between the rings of Saturn. The image is taken on April 12, 2017. This photo is also the last Earth view of Cassini-Huygens spacecraft: it will be destroyed by diving into the Saturn’s atmosphere on September 15, 2017. This method of disposal was planned to avoid potential biological contamination of Saturn’s moons, since Titan, Enceladus, and other icy moons of Saturn may harbor oceans and alien life. Until that date, it will continue orbiting Saturn at a distance of between 8.2 and 10.2 astronomical units from the Earth (an astronomical unit – or AU is the distance between Earth and Sun, it is now defined as exactly 149,597,870,700 meters (roughly 150 million kilometers, or 93 million miles). 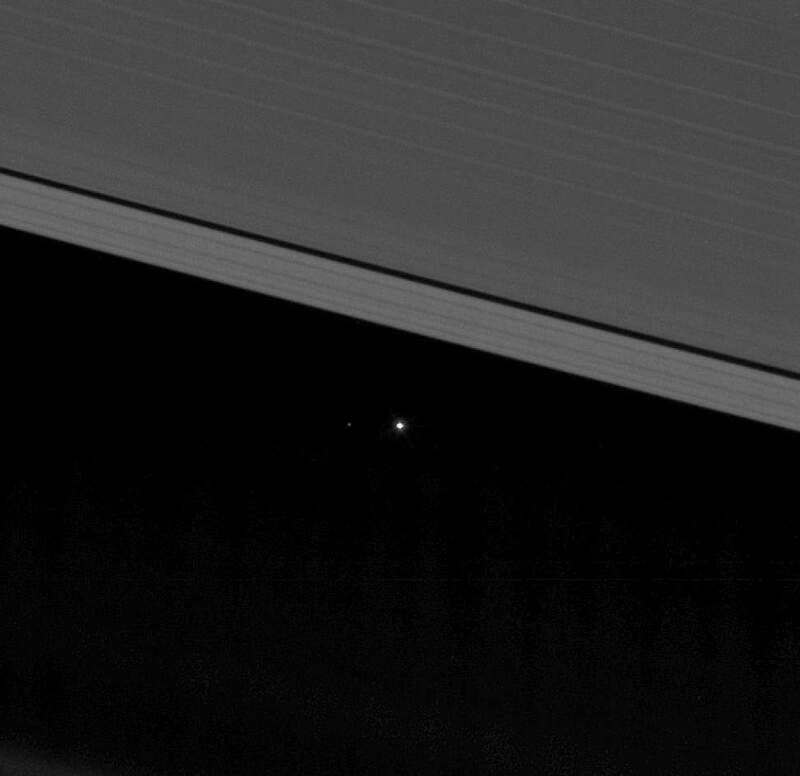 Earth’s moon is also visible to the left of our planet in a cropped, zoomed-in version of the image. Cassini spacecraft captured the view on April 12, 2017 at 10:41 p.m. PDT (1:41 a.m. EDT). Cassini was 870 million miles (1.4 billion kilometers) away from Earth when the image was taken. Although far too small to be visible in the image, the part of Earth facing toward Cassini at the time was the southern Atlantic Ocean. You can also watch the 360° interactive video and dive between Saturn and its rings with NASA’s Cassini spacecraft in the final chapter of its mission. In this 360-degree video, you are traveling along with the spacecraft at tens of thousands of miles per hour as it makes one of 22 planned dives through this unexplored gap. The first dive of Cassini’s Grand Finale takes place on April 26, 2017, with additional dives about once a week. Dive between Saturn and its rings with NASA’s Cassini spacecraft in the final chapter of its mission. In this 360-degree visualization, you are traveling along with the spacecraft at tens of thousands of miles per hour as it makes one of 22 planned dives through this unexplored gap. The first dive of Cassini’s Grand Finale takes place on April 26, 2017, with additional dives about once a week.